Each Christmas, Belmont United Methodist Church (Nashville) collects a Christmas Miracle Offering that is used for missions and ministries worldwide. 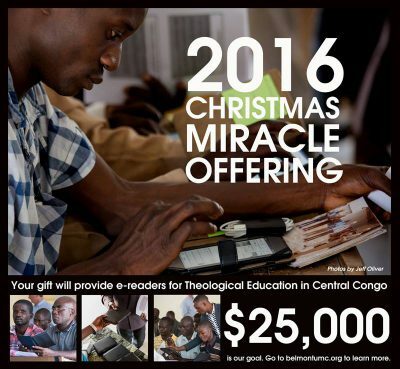 In 2016, congregants gave more than $25,000 that will be used to provide e-readers for theological education in central Congo. Without e-readers, students at Wembo-Nyama Methodist University rely on lectures from single books owned by the lecturers. Students who graduate to serve as local pastors have to leave their Bibles, textbooks, devotionals, and United Methodist Book of Discipline and Book of Worship behind at school. With e-readers, students who have made payments each semester to purchase e-readers, serve as local pastors fully equipped to be spiritual leaders across the Democratic Republic of the Congo. Durable, transportable, and tested by The United Methodist Church in Africa, e-readers are capable of containing 1,500 books and allow students to read material beforehand and have the textbooks they need to study and write their papers. In addition, the e-readers work well without Internet access and hold an electrical charge for two to four weeks. Thanks to the generosity of Belmont’s congregants, the 2016 Christmas Miracle Offering will provide about 125 e-readers. 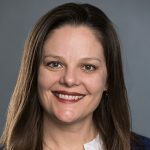 “Add to that the more than 1,500 e-readers that have been distributed to 22 theological seminaries in Asia and Africa, and one can see how these devices are changing theological education across the world,” said Kara Lassen Oliver, Director of DRI Publishing Initiatives for Central Conferences. The future of e-readers is bright. On December 13, 2016, executives from the General Board of Higher Education and Ministry and Discipleship Ministries met to sign a renewal agreement for the E-reader Project, extending the initiative between the two United Methodist agencies through the year 2020. The renewed agreement will continue providing e-readers for theological education. In addition, the focus will include United Methodist theological students in ecumenical schools and pastors in some limited areas. Cindy Solomon is a marketing consultant and content writer living in Franklin, Tennessee.